With all the scare stories being sent out in right wing emails, it is worth posting this press released emailed today from CMS regarding how Medicare patients have benefited from the Affordable Care Act. On the 4th anniversary of the signing of the Affordable Care Act into law, new information released today by the Department of Health and Human Services (HHS) shows that millions of seniors and people with disabilities with Medicare continue to enjoy lower costs on prescription drugs and improved benefits in 2013 thanks to the health care law. Since enactment of the Affordable Care Act, 7.9 million seniors and people with disabilities have saved $9.9 billion on prescription drugs, or an average of $1,265 per beneficiary. In 2013 alone, 4.3 million seniors and people with disabilities saved $3.9 billion, or an average of $911 per beneficiary. These figures are higher than in 2012, when 3.5 million beneficiaries saved $2.5 billion, for an average of $706 per beneficiary. Use of preventive services has also expanded among people with Medicare. In 2013, an estimated 37.2 million people with Medicare took advantage of at least one preventive service with no cost sharing, including an estimated 26.5 million people with traditional Medicare, and more than 4 million who took advantage of the Annual Wellness Visit. This exceeds the comparable figure from 2012, when an estimated 34.1 million people with Medicare, including 26.1 million with traditional Medicare, received one or more preventive benefits with no out of pocket costs. The Affordable Care Act makes Medicare prescription drug coverage more affordable by gradually closing the gap in coverage where beneficiaries had to pay the full cost of their prescriptions out of pocket, before catastrophic coverage for prescriptions took effect. This gap is known as the donut hole. Thanks to the health care law, in 2010, anyone with a Medicare prescription drug plan who reached the prescription drug donut hole got a $250 rebate. In 2011, beneficiaries in the donut hole began receiving discounts on covered brand-name drugs and savings on generic drugs. People with Medicare Part D who fall into the donut hole this year will receive discounts and savings of about 53 percent on the cost of brand name drugs and about 28 percent on the cost of generic drugs. These savings and Medicare coverage will gradually increase until 2020, when the donut hole will be closed. By making certain preventive services available with no cost-sharing, the Affordable Care Act is helping Americans take charge of their own health. By removing barriers to prevention, Americans and health care professionals can better prevent illness, detect problems early when treatment works best, and monitor health conditions. For Medicare, the Affordable Care Act eliminated coinsurance and the Part B deductible for recommended preventive services, including many cancer screenings and other important benefits. For example, before the Affordable Care Act, a person with Medicare could pay as much as $160 in cost-sharing for a colorectal cancer screening. Today, this important screening and many others are covered at no cost to beneficiaries (with no deductible or co-pay). This will help many seniors to stay healthy. While these are the major benefits, there are additional potential benefits such as one I reported regarding Hospice patients yesterday. Maybe this should be filmed as an ad to counter all those dishonest ads with fake horror stories being put out by the right wing. 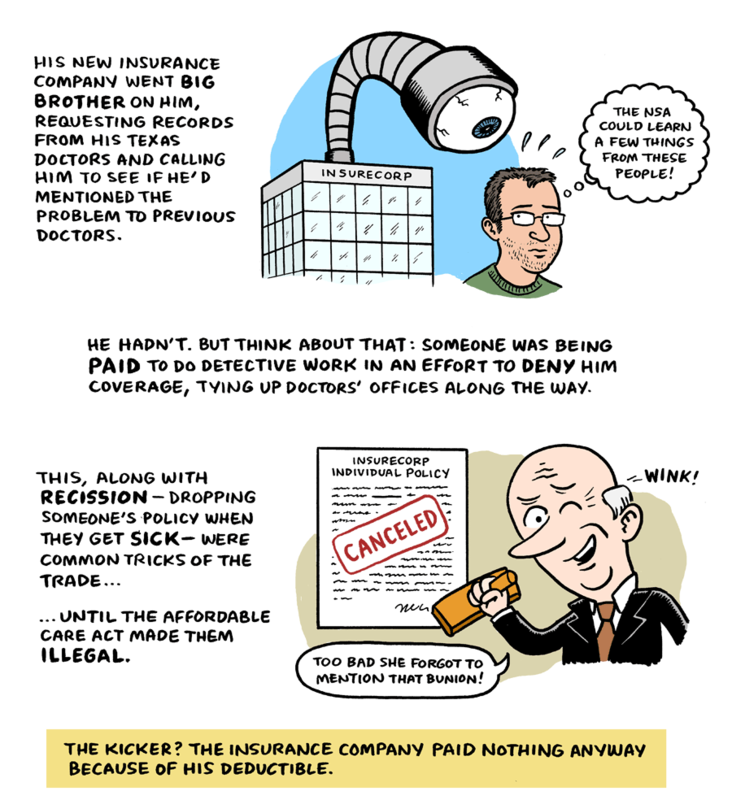 Kaiser Health News has a comic from a freelancer on her experiences in buying health insurance under the Affordable Care Act following her experiences in buying health insurance on the individual market in the past. The above portion gives an example of past problems, such as recission when insurance companies would find ways to drop people when they became sick to avoid paying claims. Check out the full comic. (Spoiler: She winds up with better insurance and saves money).